Fate helped us find this remarkable place. After a visit at the nearby zoo, we meandered down the road and spotted the rather innocuous sign. Paying our 10,000 kip admission to a smiling beret clad man in a camouflage uniform, we were suddenly plunged back in time. In front of us a pre-industrial setting of smoke, heat, and hard work. 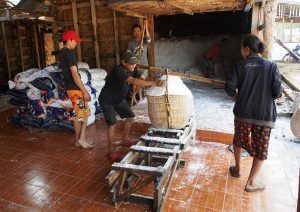 Men and women handling baskets of salt weighing in at 70-85 kg. Warehouses filled with the coarse, gleaming white salt crystals looking like ski slopes. And smoke everywhere; drifting lazily around. A mother fed her baby wreathed in smoke, while kids scooted down hills of sand on plastic bikes. The air smelled of salt and wood. Everywhere were the lines of wicker baskets used to carry the salt to be weighed, upon which their wages depend. 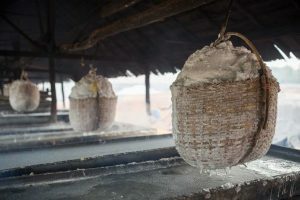 Men and women worked alongside each other stoking fires, changing salt baths, and stirring the precipitating salt crystals. Unhurried, timeless, and perhaps exhausting. I had almost forgotten that Laos and northern Thailand float on ancient salt water aquifers dating back hundreds of millions of years to when the nation was part of the sea bed. The limestone karst of places like Vang Vieng is testimony to the land’s marine fossil origins. Even in the uplands of Phongsaly one can find fossilised shell beds. It’s ironic that Lao, now famously landlocked, was once under the sea. 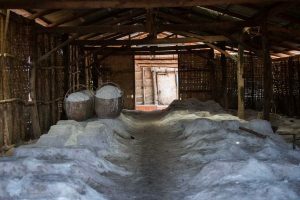 In the south of Laos around Savannakhet, salt can be the bane of farmer’s lives, rendering some areas unsuitable for agriculture, while fisherfolk love it, as salt provides the ideal medium to preserve the catch. 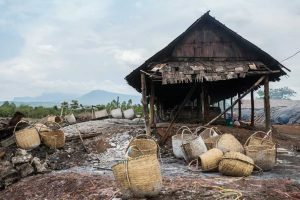 Lacking refrigerators, Lao people instead salted and fermented fish. 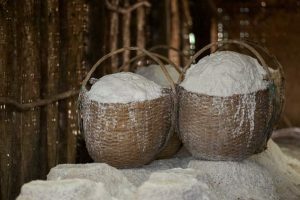 The stinky star of Lao cuisine padaek is one that travellers will become acquainted with. 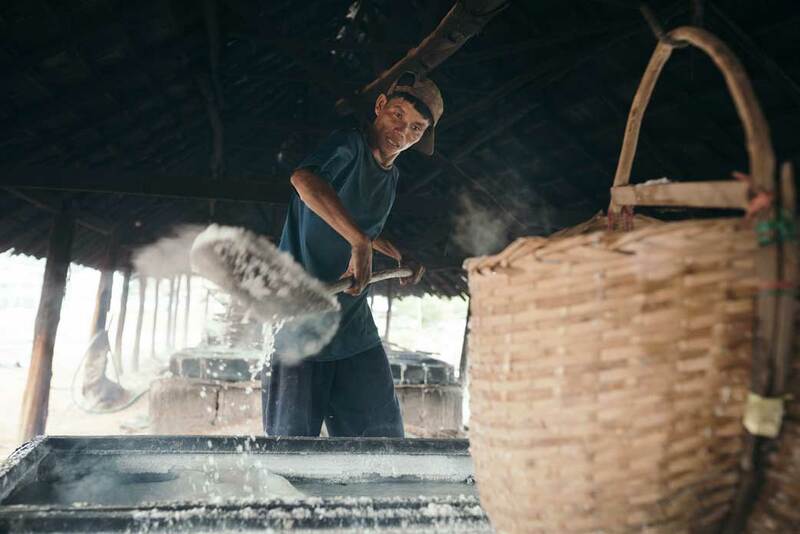 In the salt works of Ban Keun it is focal to their lives. The saline water is pumped 100 meters up from below the ground into overhead tanks, the water so saline that crystals gather like stalactites on the side of the structural work. It is then put into wide tanks, under which fires quietly blaze. The water evaporates, leaving the crystals of salt gathered like coral. A man devoid of speech shovels hot salt and gestures for me to try. I gingerly extend my hand. The salt fresh out of the hot bath is surprisingly cool. Ms. Nang with a small child hanging off her hip takes us to the back area where the sun does the hard work. Large shallow pools reflect the clouds. The supervisor strolls casually down between the rows seeming oblivious to the haulage of the women around him. Ms. Nang shows me her hand etched with deep lines by the salt, the skin blackened by charcoal. There are many myths and tales associated with the salt, like most tales about thwarted love, monsters from the deep and of course ancient royalty. These tales some say are universal to all the salt works as salt is linked so inextricably to life and death. Ms Nang was reluctant to share her stories as the sun rose hotly and her child became agitated. Five families were chosen to run and work in the production area after the government agency privatised it years ago. They all collaborate to produce a highly effective mechanism that is both amazing and a reminder of times past. In the shed, couples with bent bamboo poles surrender their loads of salt to the antique brass and steel scales. The counterweights indicate the basket weights 85 kg. The weight registered, the man and wife sigh, and bend under the bamboo poles again before taking the basket to storage. In Ban Keun history is now. We thank our hosts and followed by children, we take our leave having bought 10 kg of the crop for a tiny sum. Your admission fee helps the workers; purchasing salt or giving them small tips will help even more. 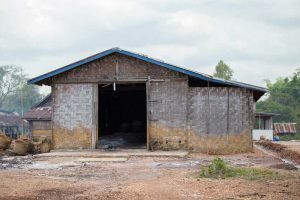 Ban Keun is about 60 km north of Vientiane and it combines well with a visit to the Wildlife Rescue Centre and Zoo, as they are very close (merely 1 km apart). It’s best to hire a car and driver, and to take a leisurely day committed to touring the area. Lakes, rivers, and floating restaurants help complete the experience.